Each November the Garden of Lights ceremony is held at VNA Headquarters in Morristown. It is free, and all are welcome to attend. Following the Garden of Lights ceremony is our Wine Tasting & Reception. Seating is limited and attendance is by purchased ticket only. Sponsorship and underwriting opportunities are available. For additional information contact Billie Goon, Development Manager at 973-451-4148 or dmyers@vnannj.org. See our 2018 Celebration of Life sponsors and advertising supporters on our blog: http://vnacelebrationoflifeads.tumblr.com/sponsors. Creating a Web Memorial is lasting virtual remembrance with photos and a written tribute of love to someone who has passed. 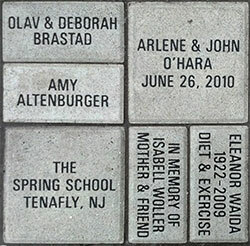 We invite you to participate in an exciting opportunity to purchase a custom engraved paver for the VNA Donor Walkway. Honor a loved one and express your support for the work of the VNA by becoming part of this very special path of caring. Download your Brick Paver Order Form here. You can enter your information, then email right from your computer. Recognize Your Entire Family or Group of Friends!